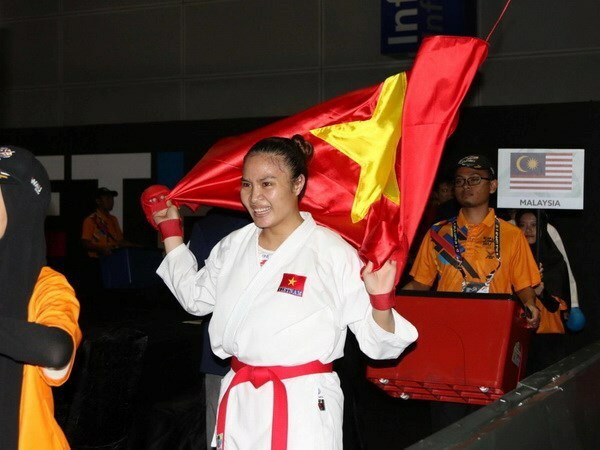 Kuala Lumpur (VNA) – Karate athlete Nguyen Thi Hong Anh pocketed the third gold medal for Vietnam at the ongoing 29th Southeast Asian (SEA) Games in Malaysia on August 22. She defeated her rival from the host Misty Philip 4-3 at the 68kg kumite event. Earlier the same day, gymnast Dang Nam and fencer Nguyen Thi Nhu Hoa brought home two golds. Meanwhile, wushu athlete Hoang Thi Phuong Giang bagged a bronze medal at the Changquan category, her second medal at the games, after winning a gold at the Gun Shu class. At the under-60kg kumite event, athlete Thanh Duy earned a bronze medal after beating his Indonesian rival 6-2. Van Nhat, Thanh Duy and Khanh Duy secured bronze medals at the men’s under-67kg kumite, under-60kg kumite, and under-50kg kumite categories respectively.